Anthony Burgess moved to Monaco in 1975, and first met Princess Grace with her husband Prince Rainier at a concert by violinist and conductor Yehudi Menuhin. After which, he and Liana were invited to several parties and lunches at the royal palace. Princess Grace, Burgess said, ‘was the last of the great hostesses. She could charm the French and control Frank Sinatra’. After her death, Burgess was one of the founding trustees of the Princess Grace Irish Library in Monaco, which holds Princess Grace’s personal collection of books representing the history of Irish literature and music, plus another 9000 volumes which have been acquired since 1984. Ted Jones in The French Riviera: A Literary Guide for Travellers (2007) states that the last book Grace Kelly read before her death in 1982 was Earthly Powers. 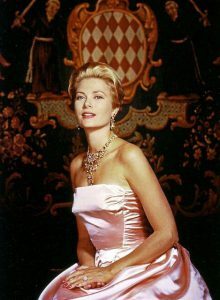 This obituary reveals Burgess’s great respect for Princess Grace of Monaco, of whom he noted ‘the dignity was genuine, the kindness was no act’.